A community in West Sussex is hoping to raise £2.5m for the complete rebuilding of its "grotty" railway station. 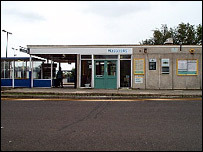 Hassocks, which lies on the mainline route from London to Brighton, got its current station when the previous Victorian one was knocked down in 1972. But the Hassocks Amenity Association (HAA) said the station had already "come to the end of its life". Network Rail said it could not afford a complete station overhaul so local people were trying to do it themselves. 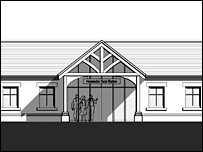 A feasibility study into the costs of building a new railway station was funded by West Sussex County Council. The results are on display at Hassocks Parish Centre on Friday and Saturday. Colin Wilsdon, a county councillor and chair of the HAA, said: "It's a really detailed study and a very detailed budget is costed down to the taps in the toilet." He said the aim of their exhibition was to start raising the £2.5m through local people and businesses, before applying for any lottery money or council grants. "I'm hoping that if we keep pushing on and find some of the money elsewhere, Network Rail might then help us in some way. "Coffers that seemed closed before may begin to open." Network Rail said: "Whilst we are not funded for improvements of this kind, we are committed to help find ways of funding this exciting project for local people." Mr Wilsdon said improving the state of the station was important to local commuters. "It's got inadequate waiting rooms, it's got nowhere to buy newspapers or get a drink and it's got a dilapidated underpass which gets mouldy and damp."